Black Jack ELiquid by iVapore: A classic 'Aniseed' flavour that everyone knows but will you love it or hate it. 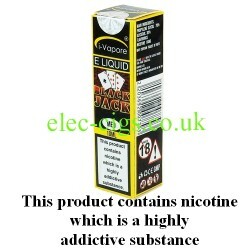 It comes well packaged in 10 ml bottles within individual boxes and in several nicotine levels. There is a full set of instructions and advice in every box of this e-liquid in addition to the sealed and childproof caps.